Western tweed scholars and irritating “foodie” epicures alike maintain that the etymology of Phở can be traced to the iconic, non-partisan, French dirty-water beef “pot-au-feu“. Low cost cartilaginous cuts of beef are slowly left to simmer on the corner of the stove for days on end, renewed with water, meat and vegetables as needed; a carnivorous proxy to a bread baker’s starter. 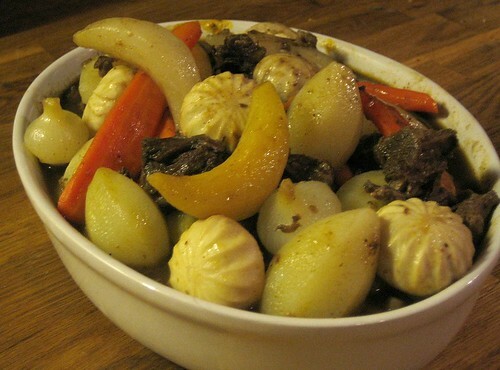 The French, who have a sweet spot for beef and colonizing swampy parts of the world from the late 19th through the early 20th centuries, introduced pot-au-feu to the Vietnamese, in addition to goldfish, flip-flops (which they previously introduced to the Egyptian trailer park community in the 15th century BC), novelty prophylactics and Jerry Lewis. 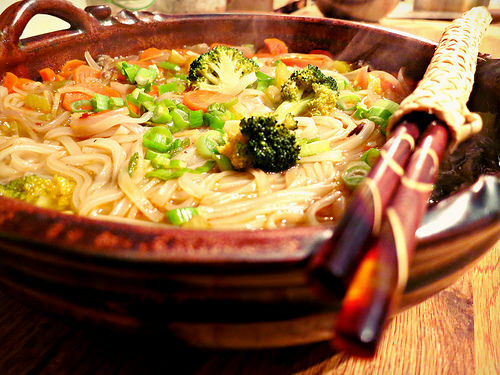 The Vietnamese took a liking to the soup and French soldiers are alleged to have been heard crying “feu!” (fire) whilst pointing to the steaming bowls of broth and wood fire below -both allegories to the syphilitic burning in their sweaty, mischievous linen trousers. Scorching cases of crotch-rot sped up France’s exit from Indochina but they left the “feu” behind, both as a nourishing broth and cootie contaminated prostitutes and toilet seats, the later of which would be America’s downfall in both the Vietnam war and failure to popularize the STD sounding “Beenee Weenee” in the Eastern hemisphere. Dr. Reinhold. Draft dodger and Beenee Weenee enthusiast. 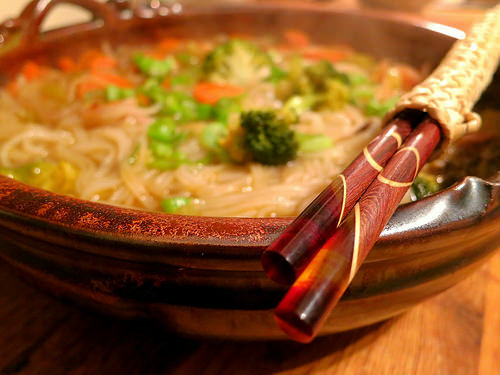 Fancy chopsticks in a woven koozie. A couple slurps of the broth and I thought “it’s not fantastic and it’s not like some homeless grandparents crapped in a bowl. It’s Alright.” Needed more of the beef fat for richness but the noodles were absolutely delicious, though they sucked up most of the broth. If you are going to drink a case of beer before something important to do and gym-mat-filling inspired injera is not readily available, eat a pack of rice noodles and you’ll be sober as a judge by lunchtime. A 2.0 version will be assembled shortly, with beef neck, the missing lemongrass, pretzels, marshmallow Fluff, herbs and more liquid. Rather successful bovine dry curing. 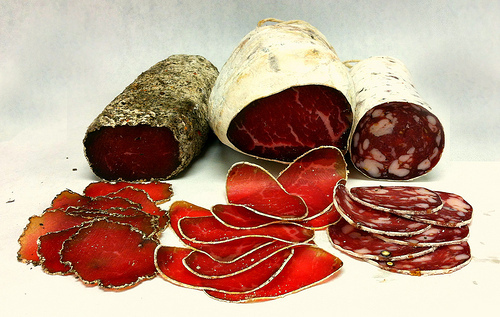 Viande de Grisson, bresaola and saucisson sec. Randall-Lineback eye of round for the VdG was cured in 2 stages (half the salt cure for 3 days, the other half for 3 more days), wiped clean of the cure mix, rolled in herbs (thyme, rosemary, oregano, and marjoram) wrapped in cheesecloth and hung in a refrigerated room –no need to ferment the whole muscle, just to dry it. Very nice color, sweet taste, but I don’t know how much the herbs contributed to the flavor. Kind of musty actually. It eventually developed a bloom after 3 weeks and when it had sufficiently dried to my liking, I pressed it (to achieve the traditional pressed shape) between wooden boards weighed down with cans of tomatoes, though any canned good with equal weight would have worked just as well I suppose. A friend of mine once pilfered in my pack a can or roasted red peppers from Buca di Beppo, whose “Pope Room” is the gold standard for Italian dining with your delinquent friends, and there is a crappy nudie bar next door (gnudi bar, by the way, would be a very good idea for a gnudi menu themed room). I was pleased as punch by the plucked can, though upon shaking it, it seemed like there was quite a bit of water in there. That sloshy sound was consistent with the contents –dihydrogen monoxide. 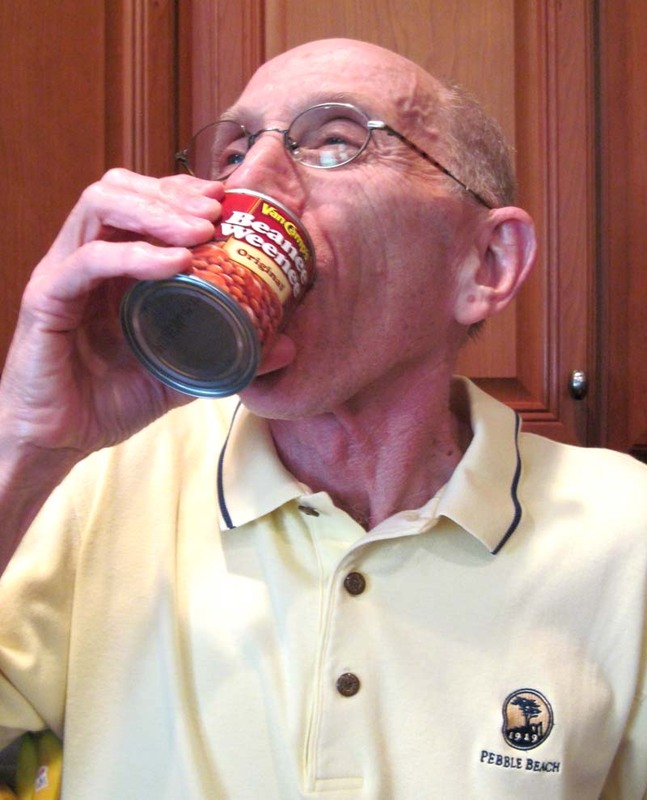 What was most amazing, was that the cans were authentically labeled, painted on, nutritional info, imported, importer address, contents, ingredients… A very convincing 5lb can of roasted red peppers that would fit in on any Costco shelf. Who makes such a mock product? And what will become of the Pope busts that bless the Pope Room tables? 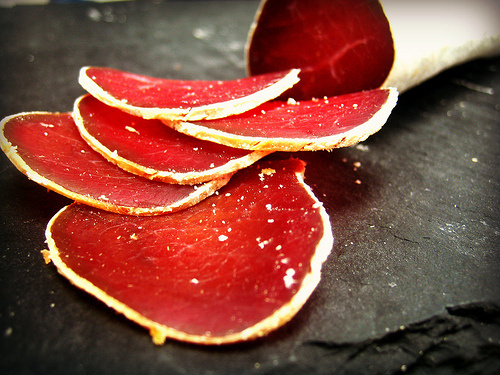 The bresaola was fabricated from an Angus eye of round, cured in the same manner as the VdG, put in a beef bung casing, brushed with vinegar and left to dry in the same refrigerated room. After a week, the bresaola began to develop a healthy white bloom and 3 weeks later was completely encased in the cherished bloom which other manufacturers artificially replicate with rice flour. Very nice color and sweet beefy flavor. Far better than the desiccated beef often passed off as the real McCoy. 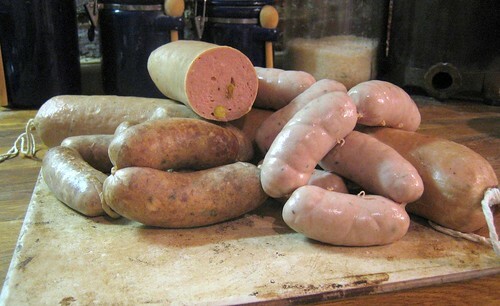 Saucisson sec was more of a challenge. Lean Randall-Lineback eye-of-round was used in lieu of pork, primarily because of the abundance of the former, and pork back fat supplemented the fat. No starter culture. Standard procedure was applied and the pieces were incubated in a plastic tub for 72 hours. The refrigerator conditions were not ideal for the proper curing (too cold, not enough humidity) and the ph of the meat may not have been sufficient. 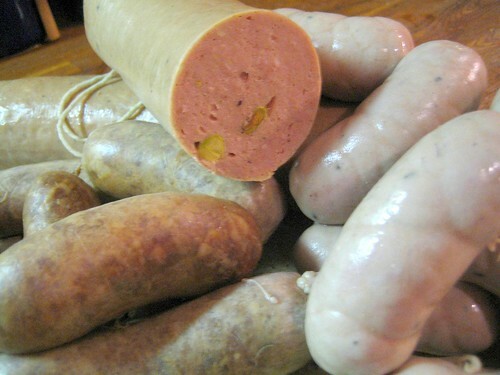 While the flavor was enjoyable, particularly the lucknow fennel seed, the sausage itself was a bit softer than desired in the middle, though the face of the slice was encouraging –no air pockets or festering inside, but the fat distribution left much to be desired. 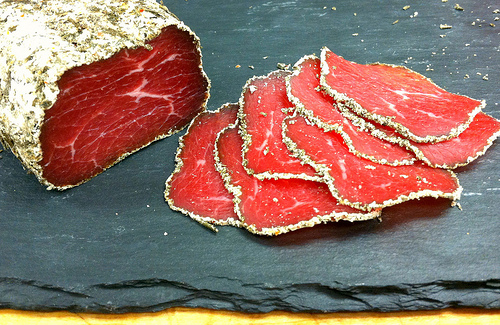 Randall-Lineback secca (the French variety of bresaola) was successful and absolutely delicious. Cured in the same manner as the Viande de Grisson and bresaola. Stuffed in a beef middle. Top notch bloom. I could have snow angels in that bloom if I was smaller. 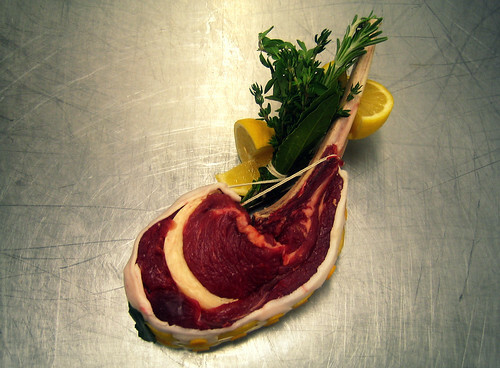 A Cared-For Rose Veal Rib-Eye. 1% rib-eye, made by the 47%. And so, as with any resource which demands resources itself to be raised, the meat in question should be treated with respect, steadfast discipline and nothing less than a proper cutting technique (clumsy woodsmen need not apply) . A chop above the rest. Beef rib-eyes generally conjure fat speckled, cholesterol fueled gluttony trophies for any high-pressured red-blooded Americans aspiring for type 2 diabetes –though to be fair, food doesn’t make you fat; lifestyle does. 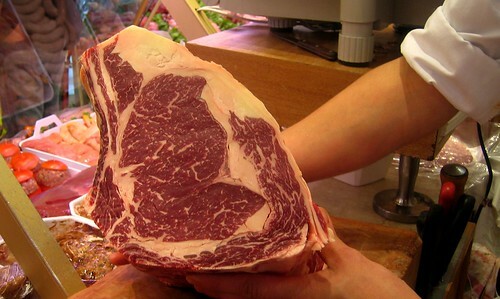 Inspired by one of the pre-eminent artisan butchers of France, Hervé Sancho, the rib-eye was meticulously denuded: the Complexus, Spinalis and Longissimus Dorsi were separated to remove the sinew and any membranes. Given the lean nature of the Lineback, fat needed to be introduced into the equation. Jubilant fat from the kidneys (not quite suet, yet) was pounded into an even thickness and introduced into the otherwise stiff meat party. The deckle (Spinalis) was sewn shut around the Frenched bones. Strips of fatback barded the outside which was then proudly ornamented with lemon and orange zest because that is what a professional who gives a damn does. In addition to providing essential flavoring, the fat retains moisture, and those variables, when applied properly, and passionately, make for an exceptional piece of meat. Cornerstone of French quality and luxury in moderation. 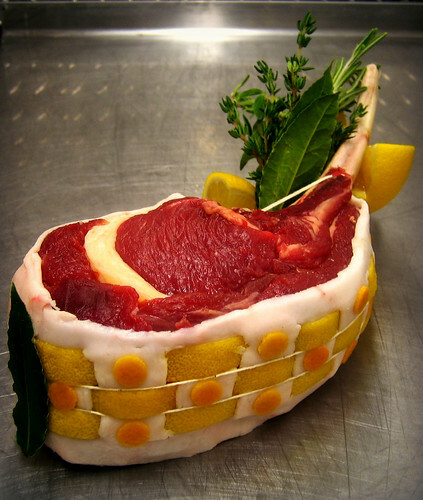 The detailed rib chop was adroitly seared then gently laid to roast on a plush bedding of sweet corn, squash and small variety tomatoes at a comfortable 325ºF until done just so. Left to rest while libations were poured, the meat relaxed, the juices redistributed themselves and a warm, sweet, roasted hush wafted over the table. The fat itself is neither a flavor nor texture that I crave, the fragrance and moisture it afforded was exceptional for an otherwise slender, straight-laced roast. Any muscle from a noble animal, no matter the rank or price, deserves at least half the attention of this one. Anything worth doing, should be done right. At least put in the effort. A toast to the buckle roast. A fiercely handsome aged roast. From a farm out in Virginia and dry-aged for 5 weeks. Sweet, feral, drool inducing aged beef-fat fragrance girdled in pork back fat with citrus and herbs. Until the USDA allows farmers to raise grass finished cattle older than 2 years (i’ve heard something to suggest that they have recently amended the regulations, but such info is difficult to find; specifics are welcome) for slaughter without sending the spinal cords for inspection to assuage BSE concerns , we’ll have to settle for pastured, grain finished since 24 month old grass-fed animals do not have the time to fatten up on the grass nature intended. 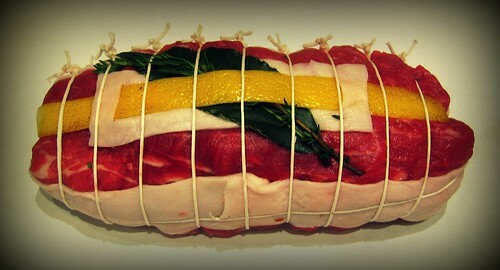 Or perhaps a top-round roast for 8, in traditional racing stripes. 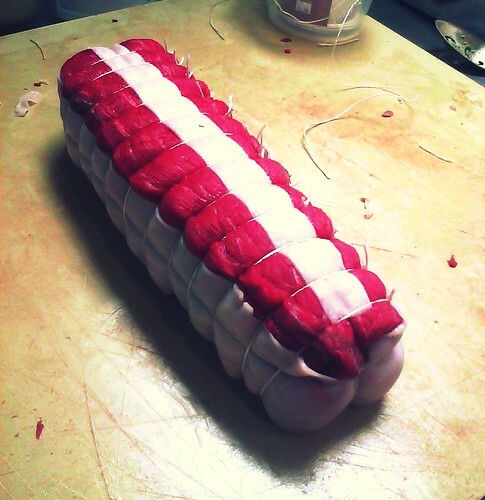 Versions or Randall Lineback wrapped in petit salé (French bacon) available as well, in addition to melon style lamb shoulders and boneless prune stuffed pork loins dutifully packaged in caul fat with appropriate spices and herbs. A rustic red wine and beef stew from the Aveyron which used to be served by its residents during Easter and Christmas and derived from the Occitan word “coufir” which mean to slowly simmer. It is generally composed of tougher, rail quality cuts such as beef cheek, shank or neck that have been marinated in coarse regional red wine and demands slower and lower cookery consistent with a braise. The traditional garnishes include mushrooms, onions, lardons and carrots which are seen in other dishes typically enjoyed during the shorter days of the year such as variations of Coq au vin or Bœuf Bourgingon. For this particular interpretation of Coufidou, beef neck segments were marinated for 4 days in a raspy bottom-shelf syrah with standard aromatics (carrot, celery, onion, garlic, thyme, bay leaf, peppercorns). The neck segments were pulled from the wine and blanched in water to remove as many impurities as possible. The segments were covered with the original marinade to preserve the resourceful vein of frugality and simmered with salt for 6 hours or so until tender. In the meantime, button mushrooms were fluted and cooked in an acidulated blanc (water, flour, lemon juice, salt and olive oil). Rutabaga and turnips were turned, carrots beveled and glazed in olive oil and a splash of white wine vinegar as were cipollini onions. Potatoes were turned and carefully simmered. The segments were cooled in the strained liquid and the meat was picked from the bones when cool enough to handle. To build the stew base, garlic was browned in beef fat, (crushed and discarded) and then crushed tomatoes were cooked until dry. The beef neck liquid was added piecemeal to the tomato product and quickly reduced to build a sauce of adequate consistency and depth to which the picked meat was added. The chocolate aroma undertones of beef and red wine are worthy of a scratch & sniff sticker. 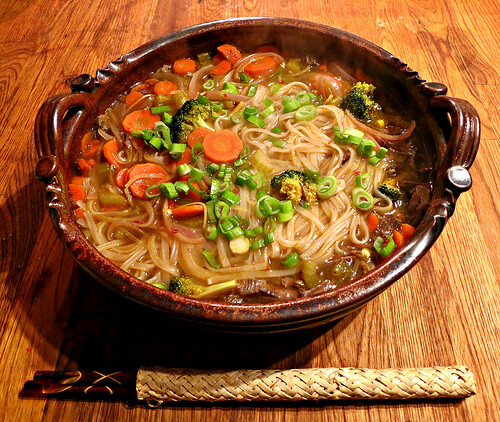 The vegetables were then added to the base and only brought to a simmer in order to meld the flavors. Seasoning was verified and the stew was heartily consumed. Stewings on the stew: The flavor profile offered a respectful triptych of beef & wine (which magically conspire to present the aforementioned aromatic element of chocolate), the sweet, earthy starchiness of the root vegetables, onions and mushroom and the acidity from the vinegar. In hindsight, the stew base could have benefited from an acidic element of either sherry or Banyuls vinegar. 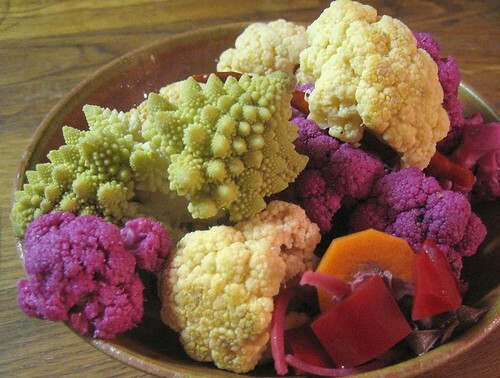 The vegetable garnish appeared to overwhelm the protein element; however that could be chalked up to the intentional emphasis on the cellar rather than the larder in the day of when proteins were a scarce luxury rather than a cheap commodity.